Motorola XOOM 3G Tablet is an amazing technology device from Motorola has an extreme 1 GHz Dual-Core processor and Android 3.1(Honeycomb) platform designed and optimized specifically for Tablets. The marvelous world of Android Tablets, Motorola XOOM has in a good position which is preferably awesome features and strictly keeps international quality standards. Motorola XOOM has a brilliant 10.1 inch widescreen display with 1280 X 800 pixels resolution and 1080p HD video playback and streaming. 5 MP camera with dual-LED flash, 2 MP webcam, 10 hours video playback time, 3.3 days mp3 music playback time etc. are the main attraction of the Tablet. 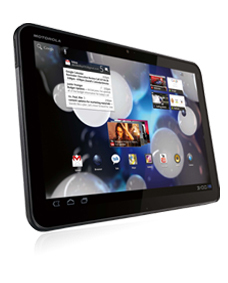 Motorola XOOM is made Anodized aluminum for soft touch experience. Micro USB, HDMI, USB 2.0, GPRS etc.